An independent task force is being set up to examine "the role of gender" at the Grammy Awards. Recording Academy president Neil Portnow said women needed to "step up" when asked about the lack of recognition they received on Sunday. Only 17 out of 86 awards went to women or female-fronted bands at the 2018 ceremony. He now says they were a "poor choice of words" and that "gender bias" in the industry needs to be addressed. "We will place ourselves under a microscope and tackle whatever truths are revealed," he said of the investigation. Pink had earlier addressed Mr Portnow in an open letter, stating: "Women have been stepping since the beginning of time." The Recording Academy, which is comprised of 13,000 music professionals who vote on the industry's most prestigious awards, said it will "identify where we can do more to overcome the explicit barriers and unconscious biases that impede female advancement in the music community." Prior to Portnow's announcement a group of female record executives, including Pharrell and John Legend's managers, called for his resignation. "We step up every single day and have been doing so for a long time," their letter said. "The fact that you don't realise this means it's time for you to step down." 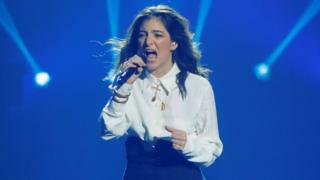 Lorde was the only female artist nominated for best album, and was also the only act in the category not to be asked to perform solo on the night. She took out an an advert in the New Zealand Herald appearing to respond to the lack of female representation. A recent University of Southern California study claimed that between 2013 and 2018 less than 10% of Grammy nominees were female. The only woman to win one of the main awards at this year's ceremony was Alessia Cara, for Best New Artist.